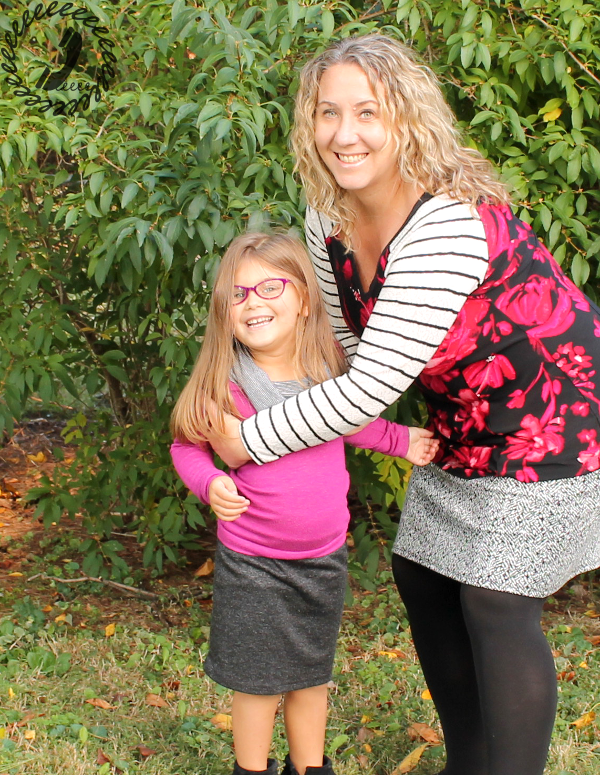 Jocole is having a Fall Blog Tour, and I thought it’d be fun to use both the Ladies and Girl’s Knit Pencil Skirt patterns to make Bean and I a few simple skirts for fall. 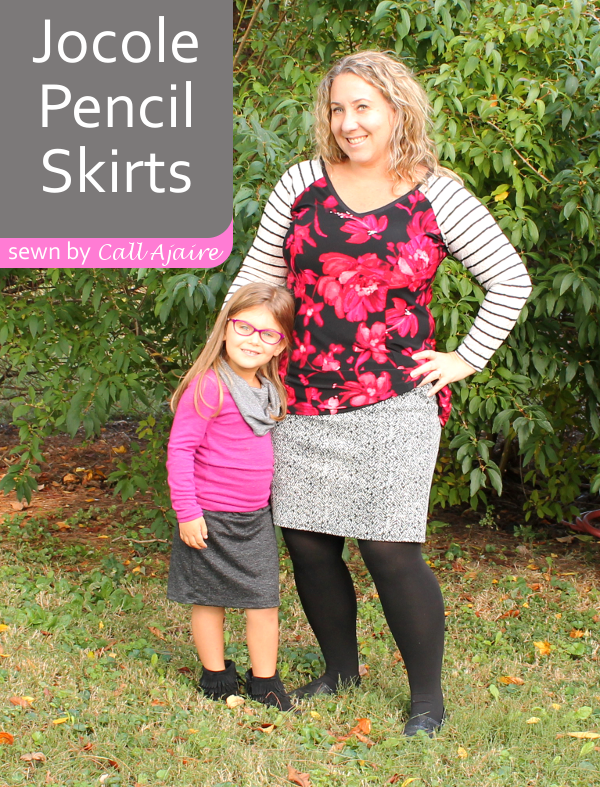 These sew up super quick and are the perfect skirt for the changing seasons. 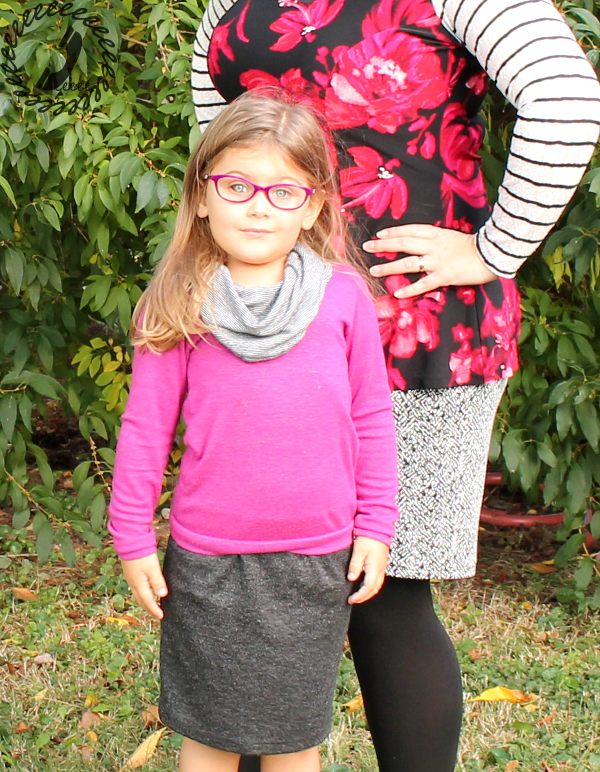 There are a bunch of great knits at our local JoAnn Fabrics right now so the options for skirts abound. These fabrics are cozy, but not too heavy and Bean said it’s “like wearing a hug,” hehe. I need to pause for a second because WHY didn’t any of you tell me how AWKWARD it can be taking pics with your kids? In almost all the pics I’m either bending down at some odd angle (and couldn’t wear heels!) or we’re just laughing so hard our faces are all blurry from moving, hehe. This is what it looks like when I ask Bean to try to stand up tall in the next pic. Haha! At least she looks adorable in her new glasses right? Anyway, back to the skirts! The girl’s skirt comes in sizes nb to 14 years with a bonus doll size. I sewed a size 5 for Bean and it’s a perfect fit. There are lots of options including different waistband heights and a yoga waistband option. I really mean it when I say these were fast to make. I cut and sewed both of these in just under an hour the other day! The Ladies pattern comes with sizes XS to XXXL and I sewed an XL for myself. 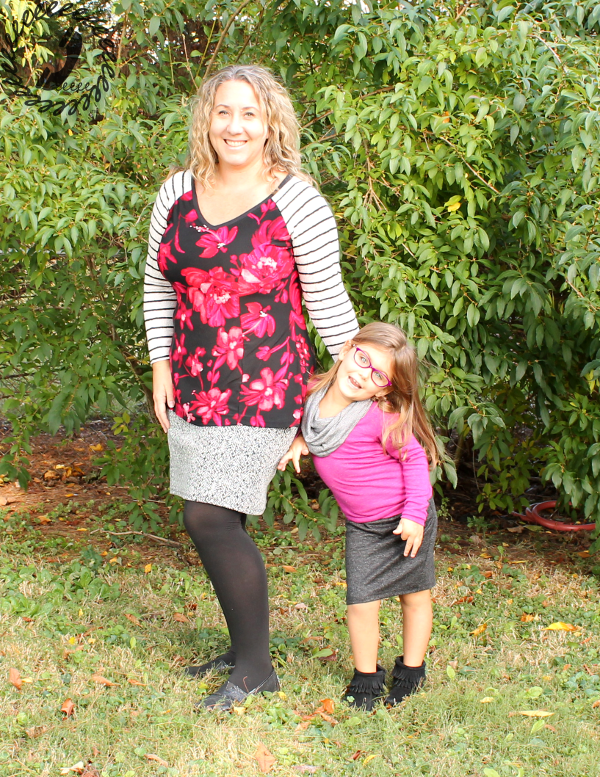 I chose the high hip waistband option since that’s where I like my waistbands to hit, and since I knew I’d be wearing this all winter with tights I made the short hemline, but there are 8 different hemlines to choose from. Since I’m only 5’2″ the short hits somewhere between where the short and the above the knee option would hit, but it’s exactly where I’d want it. If you’d like to get the patterns for yourself, they are 25% off with the code “FallBlogTour” through the 26th of October. You can also enter the giveaway below for 1 pattern of choice from the Jocole catalog! Giveaway ends on Saturday.